Perhaps you’ve read or heard about bebop scales before – they’ve been mentioned in passing on LJS in the past. But where do bebop scales come from, and how can they be used in the practice room and in practical playing situations? 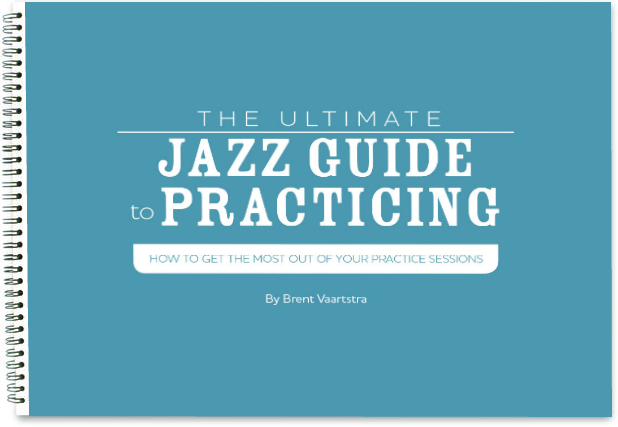 In this post, I’ll hopefully shine some light on where these useful scales come from and how you can incorporate them into your practice routine, compositions, and improvisations. Where do bebop scales come from? This is a complicated question, but I can try to provide a basic framework for understanding the history and derivation of bebop scales. Many different backstories and explanations are circulating about where bebop scales come from, but in general, the narratives seem to have some common themes. Bebop scales appear to have emerged as a theoretical concept in the first few decades after the emergence of bebop as a distinct jazz style, which occurred around the time of the Second World War in the late 1930s/early 1940s. Pioneering jazz pedagogues David Baker and Barry Harris are the two musicians most commonly credited with the development of the concepts surrounding bebop scales. It is important to note that the notion of bebop scales is a concept that arose after bebop had already emerged as a distinct style of jazz. As is often the case with theoretical constructs, the theory arose and was codified after the practice was well established. To my knowledge, there isn’t much evidence that the idea of “bebop scales” existed when Charlie Parker, Dizzy Gillespie, Charlie Christian, Bud Powell, Thelonious Monk, and the other legendary musical pioneers were developing the unique new style of jazz which we now call bebop. Instead, bebop scales were theorized after the fact as a way to explain common melodic gestures that recur frequently in bebop-style melodies and improvised solos. Bebop solos notably feature a lot of chromatic or non-diatonic notes – meaning pitches that music theorists can’t easily explain by simply referring to the traditional 7-note scales such as the major scale (the Ionian mode) and the modes derived from it (such as the Dorian and Mixolydian modes). So scholars, theorists, jazz musicians, and jazz pedagogues have developed theoretical paradigms, such as systematized bebop scales, in order to facilitate studying, learning, and talking about bebop musical vocabulary. What is the theoretical derivation of bebop scales? There are many different ways to think about how bebop scales are derived. Here’s the simplest and most direct explanation: you can generate bebop scales by adding strategically placed passing tones to common scales and modes from traditional Western music theory, including the standard diatonic or “church modes” derived from the major scale. 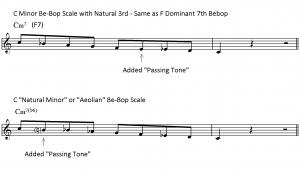 Bebop scales are essentially major, minor, and dominant scales with one or more added “passing tones,” which are extra “chromatic” or “non-diatonic” notes. 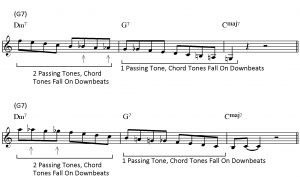 It is important to note that in theory and in practice, bebop scales are generally thought of as descending scales, meaning they make the most sense, sound the best, and are most often used when playing descending stepwise melodies. What are some examples of bebop scales? Let’s first look at the major bebop scale. Another common bebop scale is the dominant seventh (or Mixolydian) bebop scale. How can you use bebop scales? As the name suggests, bebop scales are particularly useful for generating melodic vocabulary in a bebop context, but they can be deployed while improvising in other jazz styles and non-jazz settings as well, as long as it’s stylistically, expressively, and aesthetically appropriate. Bebop scales also provide an excellent system that allows you to incorporate more chromaticism in your playing. Additionally, using bebop scales allows you to think about scales rather than just individual chords while improvising. In other words, bebop scales can help you to start think more melodically as opposed to harmonically. 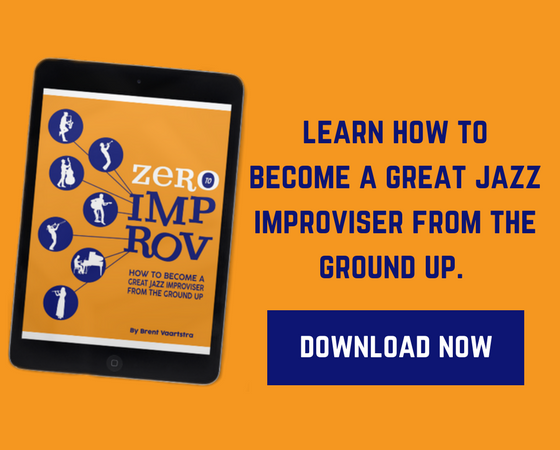 Although arpeggiating chords and outlining harmonic guide-tones are useful approaches all aspiring jazz musicians should master, it will give you even more ideas and greater flexibility as an improviser if you master bebop scales as well. 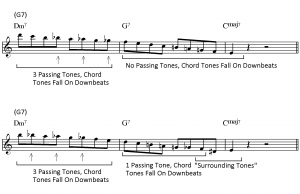 Another reason bebop scales are especially useful is that they can allow you to systematically control which part of the beat chord tones fall on when playing a stepwise melody. Since most scales derived from the Western modes have 7 notes before repeating the tonic pitch, they are rhythmically asymmetrical when played as stepwise 8th note lines. Practically, this means that if you play a descending 7-note scale in 8th notes, the chord tones associated with that scale will not always fall on the downbeats. By adding a passing tone to a scale, you now have an 8-note scale, which is rhythmically symmetrical – meaning you can play the scale ascending or descending in 8th notes as a stepwise melody and have all the chord tones line up with the downbeats. 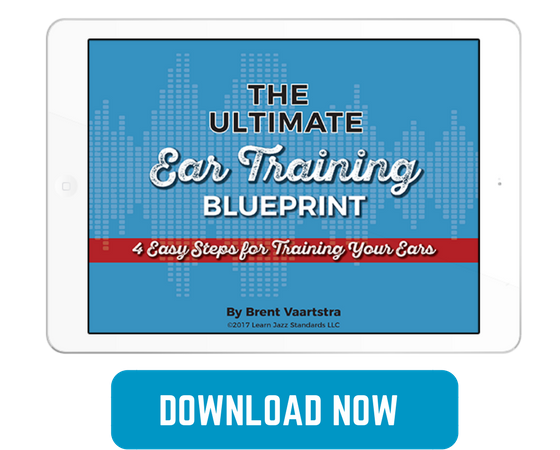 By making all the chord tones land on downbeats, you will be able to clearly communicate the harmonic progression of a tune without arpeggiating chords, since the ear tends to place more importance on notes that fall on rhythmically strong beats. Now that you have a basic framework for understanding bebop scales, I hope you feel empowered and inspired to start using them! It’s important to remember that bebop scales, like any other scales or musical systems, are just theoretical building blocks to help you conceptualize, learn, and internalize jazz vocabulary. Bebop scales are great tools, but as with anything else, be aware that there’s always risk that using the scales will become counterproductive if you overuse them or use them in a stiff, dry, or mechanical way. As you practice bebop scales, think of them as just another tool in your toolkit as you develop your ears and your arsenal of melodic vocabulary. Don’t forget to vary your melodic vocabulary and expand your musical palette as much as you possibly can while listening, practicing, improvising, and composing. And as you practice bebop scales, always try to come up with strong melodic statements based on the scales as opposed to mechanically plugging the scales into your solos. Don’t fall into the trap of playing music as if you’re trying to solve a jazz math equation. Instead, treat your music as an emotionally expressive and communicative art form. As you practice, improvise, and create solos and compositions, try to remember to explore and vary the other elements of music as well, such as rhythm, dynamics, timbre, structure/form, and range. Practice and sing bebop scales in all twelve keys. Practice them in ascending and descending form, but with greater emphasis on descending form. Also, try playing them over as wide a range on your instrument as possible. Try writing out an entire chorus using only 8th notes in stepwise motion. Pick a tune and make it your goal to write out one chorus of a “solo.” Try to only use bebop scales and write descending melodies in stepwise motion (you can leap up a melodic 7th when necessary to avoid any range issues), and focus on trying to make chord tones fall on the beat. Write a bebop contrafact using bebop scales. Pick an existing set of chord changes from a jazz standard or bebop tune you like and compose a new original melody over the existing changes using bebop scales as an inspiration for melodic material. Invent II-V-I lines using bebop scales and practice them in all twelve keys. Again, focus on descending stepwise melodies with chord tones falling on strong beats. You can use my lines above as inspiration and a model or guide to get you started, but your lines don’t have to be like mine! Try using bebop scales in your solos on gigs and at jam sessions. After practicing bebop scales in the practice room, try hearing them in your head and applying them while improvising when it’s musically appropriate to do so. The trick is to avoid mechanically regurgitating the scales, because that just makes your solo sound like a dry intellectual exercise. Instead, try to use fragments of the scales as melodic material, and try to imagine melodies based on the bebop scales that sound good and express what you want to communicate emotionally with the music. the music is all blurry ! Now I finally see the light!! Thanks! Great explanation! As a relative beginner, I am still confused about how to use these scales, but this really helps point me in the right direction and get a few steps down the road. I appreciate it!